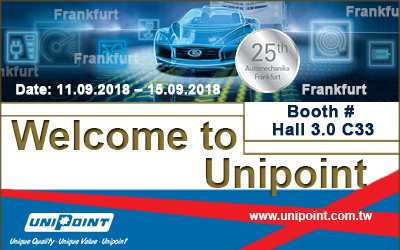 Unipoint is pleased to announce our participation at the forthcoming AUTOMECHANIKA Exhibition in Frankfurt. It is our 9th time attending the show since year 2000 and we sure want to see you again this year! It will be a pleasure to meet you there and discuss what we have been doing, pass on information, talk about our business together and give you an insight of what we plan to do for the next 2 years. We can organize meetings and have Unipoint associates from all regions worldwide to discuss directly with you our business together. There are samples of our new products emerging from R & D, catalogues, new developed app featuring with product search functions and other information exchange material. So why not come along and take a look and renew old friendships? All are welcome! We look forward to meeting you at our booth. We feel it will be a worthwhile experience for all of us! We wish you a safe trip to Frankfurt in September!